Occasionally we do more than just eat food, talk about food, and make plans to get food. But our recent trip to The Candle Lab certainly smelled good enough to eat! With over 120 scents to choose from (all listed in alphabetical order), you can create your own custom scented candle or just purchase a singular scent straight off the wall. After placing our drink orders (because who can resist a cocktail while candle making? ), we started at the end of the row and sniffed our way through the alphabet, writing down those those tantalized our nostrils. Some of us wrote down nearly half the wall, but thankfully they helped up narrow down which scents blend well together. But before we could mix and match we also got to chose the jar in which we wanted our candle to form in to. Only then could we mix our scents into the natural soy wax complete with cotton paper wicks. We poured 8oz. candles which should last about 60 hours. And our group came up with all the delicious smells, many of them food related, which should come as no surprise. I (Erin –The Spiffy Cookie/Spiffy Columbus) mixed up Ginger Ale, Bordeaux, and Verbena. Nikki (Sweetly Cbus) lived up to her name by combining Strawberry, Baked Bread, and Key Lime into a candle almost tempting you to actually eat it. Mary (Fervent Foodie) made us all jealous with her combo of Baked Bread, Hazelnut, and Dark Chocolate. Nutella bread anyone? Robin (Cbus Love Love) mixed the richer scents of spiced rum, maple syrup, and added a plash of refreshing grapefruit. Malini (Lakes and Lattes) went for the exotic scent of Basmati Rice and combined it with Rosemary and Verbena. Once our scents were chosen, the pouring process was quite quick but then came the solidification time. Thankfully this Grandview location is within walking distance of many great bars and restaurants so we had no difficulty finding what to do with our time while we waited. Sure enough by the time we were done eating at the Grandview Cafe our candles were ready to come home with us! 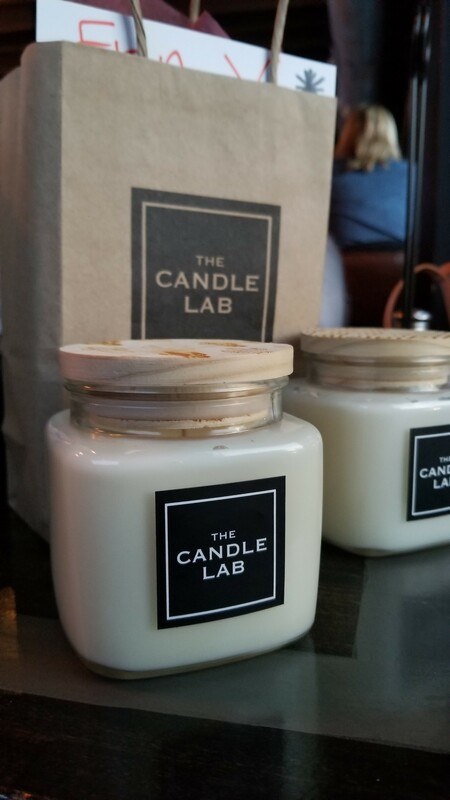 The Candle Lab originally opened in Worthington in 2006 and we visited their second location in Grandview. They also have two stores in Cincinnati, one in Pittsburgh, and are about to open up a location across the street from the Convention Center later this summer. Not into candles? You can also customize your own room spray, reed diffusers, lotions, and more. Want multiple scents? Buy 3 and get one free! From left to right: Cassie (Brunch N Breweries), Mary (Fervent Foodie), Robin (Cbus Local Love), Nikki (Sweetly Cbus), Cece (The Food Riders), Malini (Lakes and Lattes), Erin (The Spiffy Cookie/Spiffy Columbus), Stacy (Eat Pretty 614), Christina (Cbus Food Authority), Jordan (Midwest Foodfest), Alyssa (The Daily Dish), Caroline (Columbus Culinary Connection), Alina (Tasting Columbus), and Sam (Sam Says Yum). Interested in collaborating on a meetup or becoming a member of the Columbus Food Bloggers group? Please email us at: cbusfoodbloggers@gmail.com.